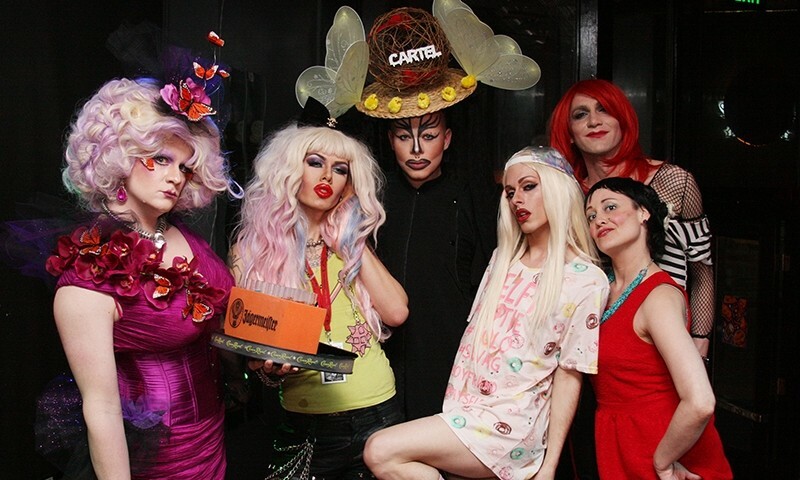 (L–R) Harry-it Winston, Tony Berrow, Cartel Chameleon Fenicé (host), Lisa Dank, Sissy Riot and Allison Martin are a few Bad Kids involved in their recent pageant preliminaries at Club Metro. 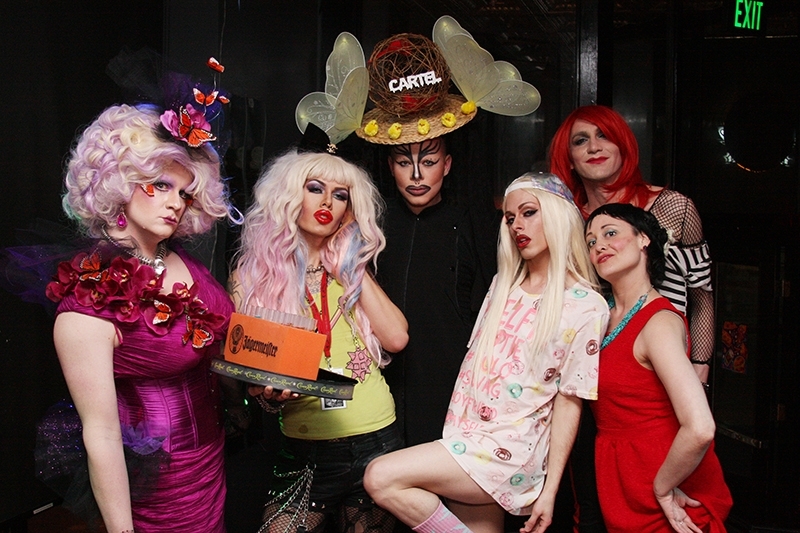 Since the summer of 2012, the Bad Kids Collective has shaken up Salt Lake’s drag scene, made connections with the global genderfuck community and established a home for queer artists at Metro Bar. Now, at “terrible” 2 years old, SLUG catches up with founding braintrust Cartel Chameleon Fenicé and performers Jezebel Jet and The Bearded Femme about where they’ve been, where they’re headed and why their approach to gender-integrated performance art is a vital force in queer Utah. What began as a small group of friends challenging Salt Lake’s gay club scene has now blossomed into a thriving home. Metro Bar’s Dance Evolution, hosted by Jeffery Hacker on Thursday nights—along with the help of Bad Kids—has attracted the hippest, most varied club crowd in Salt Lake. “It’s been really uplifting for us as a collective that we’re gaining more exposure,” says Jezebel about their well-earned success. Their local success has manifested in the positioning of Salt Lake City on the national gender performance circuit, which now brings a variety of nationally recognized gender performers into town every month. The group’s numbers swelled when Klaus and Cartel decided, as a joke, to host their own pageant last spring, which established Jezebel, The Bearded Femme, and the pageant’s winner, Mae Daye (crowned “Teen Scream, Baddest Kid of All”), as next-generation trailblazers within the collective. While planning this year’s pageant, the Bad Kids were faced with an overwhelming number of applicants and, rather than turn anyone away, two preliminary shows were held in addition to the main event, to be held on June 5. The pageant, which is meant to be fun and fluid, actually establishes meaningful titles within Utah’s QLGBT community for young performers to aspire to. With all-inclusion as their M.O., The Bad Kids truly operate as a collective of diverse performers and ontologically questioning artists. “If any single core person were to be taken out of it,” Cartel says—Jezebel finishes to say, that “it wouldn’t be the same.” Cartel continues, “That’s why it’s a collective, because we function so well together and we bounce ideas off of each other—we become inspired by each other.” This mindset ensures that each show features a rotating cast of performers, which also allows for performers to take time off in between shows without denting the group’s quality. Each Bad Kid interprets performance in their own ways, with their own unique styles and talents. “It’s taking drag and making it punk—that’s the art of it,” says The Bearded Femme. “You’re taking pieces of pop culture, recontextualizing them and making it personal. You can take these things, and it may have not been the original artist’s intention, but you’re putting your own twist on it, exploring your own body,” he says to Jezebel about a recent performance. The biggest reason for disenfranchisement within queer culture for the Bad Kids is their unflinching approach to non-binary drag. The term “drag” itself is old-fashioned. “That word is like a hot coal that we don’t want to hold for too long,” says Cartel, who explains that what the Bad Kids do isn’t necessarily drag. Rather, it’s performance art. Her intent is not to look pretty or “fishy”—“it’s to make people think,” she declares. In turn, The Bearded Femme says, “We want to make people uncomfortable,” and Jezebel maintains that their performative discomfort can only push them to evolve as artists. This year’s pageant, titled Ghouls and Dolls, takes place on June 5, headlining Metro Bar’s 2014 Utah Pride Festival festivities. Members of The Bad Kids Collective will also participate in SLUG’s second annual SLUG Cat on May 24, which features Metro Bar as one of its stops. SLUG’s online column, “Creature Feature,” has followed the Bad Kids from their beginning to the brilliant, thriving queer constellation it continues to be. Find everything “Creature Feature”—interviews, photo galleries and performance reviews—online at slugmag.com/columns/creature-feature.